Lara Crofot is back and doing it all over again with the expected delivery of her next title, Shadow of the Tomb Raider. This special edition, called Croft Edition, includes a series of very succulent extras for the followers of this franchise. 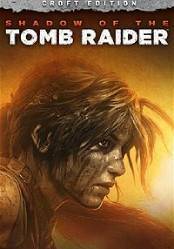 Survive again to deadly jungles and overcome terrifying tombs full of enemies and traps along with Lara Crft on her way to become the most prestigious of grave robbers. Great graphics, great story, great franchise, but its been so repetitive since they tried to reboot it. Feels more like a modern shooter than a game about a badass archaeologist.